I will be leaving for vacation with my family tomorrow morning, so posts will be infrequent for the next week. We’re going to be staying at our timeshare in Myrtle Beach, South Carolina; it should be fun as I haven’t been there in five years. I’ll be Interweb-less for most of the week, but if we have some rainy days I’m sure I’ll find an Internet connection somewhere. Expect a bunch of pictures when I get back, because I finally purchased a memory card for my camera! Woohoo! I can’t believe I didn’t know about this earlier. I used this tip yesterday to take some pictures of our dogs playing in the pool, mid-air water droplets and all. pulp n. 1. A soft, moist, shapeless mass of matter. These two definitions serve as a declaration, a warning, for what you are about to see. Pulp Fiction lulls the viewer into a type of interested trance; dozens of times during the movie, I kept wondering what the heck was going on, but I watched because I wanted to know. The movie seemed extremely (and very suddenly) violent, but most of the violence is off-screen. The plot and characters seem both derivative and highly unconventional… which seems impossible. Let me explain: although many parts of the story and players are ripped straight from other movies and genres, the whole they comprise is pure original. I see Pulp Fiction as a movie collage. The DVD I bought was the Collector’s Edition—I highly recommend this slightly more expensive upgrade—which came with a ton of bonus features including an enhanced “trivia” mode. Similar to VH1’s Pop-Up Videos, short bits of background or related information was displayed on the bottom of the screen continuously throughout the movie. It would be great for those interested in learning about the inspiration behind different camera angles or scene layouts, but also those looking for information that an audio commentary wouldn’t necessarily convey. I wasn’t sure what I thought of the movie the first time I watched it, but the film actually improves with repeat viewings. 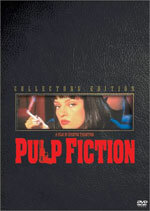 If you like witty and original movies and don’t mind violence or filthy language on the screen, buy Pulp Fiction (Collector’s Edition). Annie and I rented Sideways from Blockbuster tonight and I was a little disappointed. I loved the book which inspired the movie—as you well know—so I was hoping for greatness with the film. Perhaps my expectations were too high, but it didn’t do much for me. It’s almost passé to say that the book was better than the movie, but it’s certainly true in this case. Sideways the book was smarter, funnier, more informative, and more fun than Sideways the movie. My recommendation is to watch the movie first—Annie hasn’t read the book yet and really liked the film version—before you ruin a good movie with a great book. For the past few weeks, I’ve really enjoyed having the time to read for fun. When I was in school, it was rare for me to have time to read a non-required book in my spare time; there really is a limit to how much reading is possible in one day. Since graduation I’ve already finished two books, a bunch of magazines, and innumerable articles on the web. Annie gave me three books as a graduation present. I started with Sideways by Rex Pickett because it seemed like an easy read; it was. However, it contained smart prose, great character development, and many fun facts about wine. I borrowed Night by Elie Wiesel from my brother and read it in a few hours; I’m sure it was much more shocking when it came out, but it’s powerful and upsetting nonetheless. At the moment, I’m working my way through Essays by George Orwell, a massive 1,400 page collection of 200 or so non-fiction essays he wrote during his life. It sounds like homework, but Orwell’s one of my favorite authors and his writing style is superb. Each article is polished to a shine that slides the reader through each sentence. I still haven’t touched The Grapes of Wrath by John Steinbeck—it’s the third book from Annie—and I have a few other books I’ve bought on sale over the past year or two that I didn’t have time to read. I’m really enjoying reading on my own time: it’s fun. I’ve posted a list of books I’m reading or have read recently in the sidebar. It’ll help you kids keep up with me. You can see a full list of books I’m interested in reading by viewing the books on my Amazon Wishlist.